SCHRIEVER AIR FORCE BASE, Colo. (AFNS) -- The Operationally Responsive Space-1 satellite launched June 29, 2011, and has been a star Air Force performer since its first day on orbit. Members of the 1st and 7th Space Operations Squadrons celebrated the spacecraft's second birthday recently. "This is a great time to recognize all of ORS-1's accomplishments, but we're not looking to rest right now," said Lt. Col. Toby Doran, the 1st SOPS commander. "We're focused on continuing to push innovation and the utility of this system." The vehicle has earned numerous awards from the scientific community thus far. It was named one of the top 25 most important concepts by C4ISR Journal, an intelligence, surveillance and reconnaissance industry magazine, and the 2012 Mission Sustainment Integrated Product Team award from the Association of Old Crows, an association that advocates for electronic warfare, information operations and cyber technology. Designed as a quick-response and low-cost alternative to traditional satellite systems, ORS-1 differs in several ways, but its primary distinction stems from its birth. It took approximately three years to develop from concept to launch and on-orbit operations, compared to seven years or longer for traditional systems. Its payload technology was gleaned from a camera first developed for use aboard U2 spy planes decades ago. Contractors attached a larger telescope to the Senior Year Electro-Optical Reconnaissance System-2 camera to give it adequate resolution from orbit. "It was initially designed to operate for only a year, but 1 and 7 SOPS engineers and operators discovered they could expand the life of the vehicle by pushing it to a higher orbit," said. Lt. Col. Tony Calabrese, the 1st SOPS director of operations. "They also found that the higher orbit would not substantially affect the required quality of its images. That action alone extended the life of ORS-1 by three years." Doran explained that the 1st and 7th SOPS, also known as Team 8-Ball, will continue to take innovative steps to prolong the vehicle's life even further, upwards of five times its original lifespan. For instance, the team informed U.S. Central Command leaders that they could deliver effects on short-notice, urgent, high-priority tasks earlier this year. USCENTCOM officials responded a short time later when a CH-53 Sea Stallion crashed in a remote location. "They sent us a message saying they had a helicopter go down," Calabrese said. "They gave us a location and a tasking to get an image, and we made a quick turn that exceeded all expectations." In the meantime, the squadrons also expanded ORS-1 capabilities beyond a single combatant commander. "We're focusing on the future," Calabrese said. "The vehicle was designed to support CENTCOM, but we recognized it could do so much more. We sent word out to U.S. Pacific and U.S Africa Commands, and reached out through the Joint Functional Component Command directly to combatant commander staffs to let them know we could support their taskings too. All they needed to do was ask." As a result, ORS-1 now provides effects for PACOM on a regular basis and does so occasionally with AFRICOM and Special Forces commands. "Our crews in 1 and 7 SOPS understand the effects and impacts we're making around the world," said Capt. Eric Palmer, the 1st SOPS Operations Flight commander. "Since getting involved in these ad hoc tasks, our members have come to work even more excited. We know we are making an impact; we're innovating and asking for more. There's a lot of pride and sense of job satisfaction." Doran inferred that the point behind the Team 8-Ball anniversary ceremony was to acknowledge ORS-1's success, but more importantly, announce their intent to focus on future capability and performance. "Hopefully, we can provide effects to all combatant commanders," Doran said. 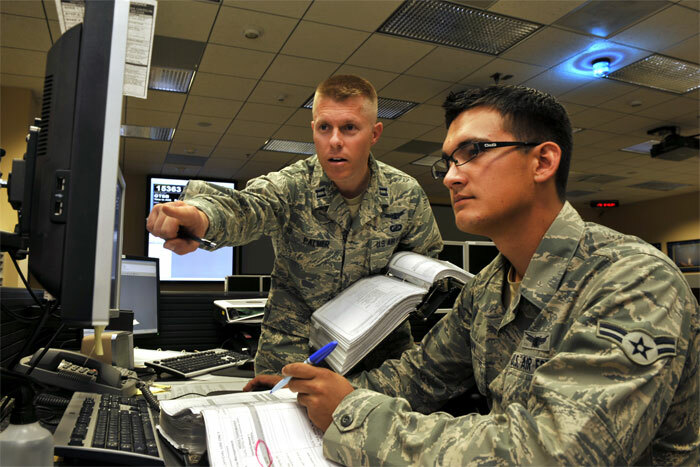 "Team 8-Ball is demonstrating that Airmen, military, civilian and contractors can take systems and make them incredibly powerful."